January’s Frye Festival Newsletter is posted here. This entry was posted in Frye Festival on January 15, 2010 by Ed Lemond. 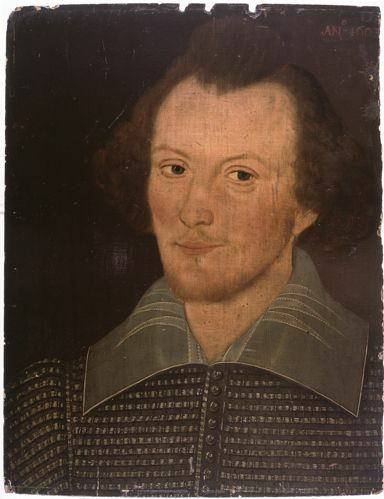 The “Sanders portrait,” the “Canadian” Shakespeare unveiled in 2001, purportedly painted from life in 1603. Russell’s post on Greene and Shakespeare raises a number of questions about the relation between literature and ideology — a subject that has always been at the centre of literary criticism and shows no sign of going away. Frye, in a display of irreverence as cheeky as Greene’s, famously observed (referring both to the relatively thin biography and the posthumously published Droeshout portrait) that we have very little hard data about Shakespeare: a few signatures, a handful of addresses, “and the portrait of a man who is clearly an idiot.” As Russell points out, Frye is always able to make a distinction between the “man” (who may possess idiotic personal qualities and even more idiotic ideological views) and the “writer.” For current critical theory and practice, this must seem an indefensible position. How is it possible for anyone to produce work independent of their all-encompassing social conditioning and the prejudices it spawns? For Frye, the answer begins with the fact that literature possesses both “autonomy” and an “authority” unique to it. Literary archetypes — whose universality can be discerned by the widest possible inductive survey of literature throughout history and across cultures — are expressive of imaginative constants and primary existential concerns. Moreover, the context is fundamentally different. Language in its everyday social function is “work”: expressing beliefs, necessities, truths, and so on. Literary structures, on the other hand, are, in their imaginatively recreational function, “play”: they “exist for their own sake” and provide no requirement of belief or claim to truth. Ideology, in short, compels; literature invites. And upon that distinction everything follows, including the fact that the writer (like, say, T.S. Eliot, about whom Frye directly addresses this very issue) may be consciously pushing a personal ideological agenda from which the literature itself displays a stubbornly independent purpose. This is why literature is potentially “visionary”: it provides us with a clarified sense of what we want and who we would like to be without providing any compulsory program of action or belief. Literature as recreation merely provides the opportunity for re-creation; it does not and cannot compel it. What we choose to do in response to the existentially concerned but still aesthetic experience of literature is always entirely up to us, including (as we know all too well) doing absolutely nothing at all. So what does Shakespeare’s “rank as a poet” really amount to? It may be summed up by the fact that he does not ever subordinate the autonomy and authority of his art to any external consideration: “all the world’s a stage” is not just a clever conceit in Shakespeare, it is a radical metaphor of his imaginative worldview. As Frye puts it, “In every play Shakespeare wrote, the hero or central character is the theatre itself” (OS 4). He may reflect the beliefs, biases, anxieties and prejudices of his time in a way his audience might recognize and even approve of, but he doesn’t promote them. The Merchant of Venice is nowhere close to reducible to the anti-Semitism it conjures; The Taming of the Shrew overturns the complacent sexism it renders; The Merry Wives of Windsor unexpectedly offers up a more egalitarian and tolerant vision of society once the knockabout farce has played itself out; and Titus Andronicus proves to be a powerful meditation upon the grisly absurdity of the human capacity for cruelty. Why? Because Shakespeare allows his plays to play without ever feeling the necessity of putting them to work in the name of some ideology, however noble or well-intentioned it may otherwise claim to be. This entry was posted in Ideology, Imagination, Literary Criticism, Shakespeare on January 15, 2010 by Michael Happy.